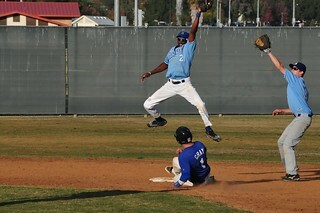 Dodgers - 1st Inning: Spencer Wolfe draws a walk and steals 2nd. Jason Kent doubles to right; scoring Wolfe. Stephan Ohayon singles to left; scoring Kent. Ari Shandling is hit by a pitch; then advances to 2nd on a wild pitch, with a run scoring on the play. Matt Gray walks and steals 2nd. Brian Meyer singles; then advances on a throwing error with a run scoring on the play. Danny Shandling singles to right. Dodgers get 6 runs on 4 hits; with 1 Royals error and an man left on base. 6-0 Dodgers. 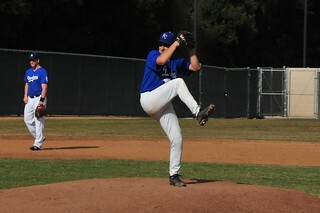 Dodgers - 2nd Inning: Spencer Wolfe draws a leadoff walk and soon steals 2nd. Jason Kent walks. Both would advance and score on account of a wild pitch and a fielding error. Dodgers get 2 runs on no hits; 1 Royals error and 1 man left on base. 8-0 Dodgers. Dodgers - 5th Inning: Ari Shandling doubles to right and then advances to 3rd on a wild pitch. Matt Gray walks. Brian Grube hits an RBI double to left. Brian Meyer hits an RBI double to left. Danny Shandling follows with an RBI double. Dodgers get 4 runs on 4 hits; with one Royals error and 1 left on base. 12-0 Dodgers. Royals - 6th Inning: Armando Mesa reaches base due to a fielding error. Ryan Elliot hits an RBI double; scoring Mesa. Royals get 1 run on 1 hit; with 1 Dodger error and 1 man left on base. 12-1 Dodgers. 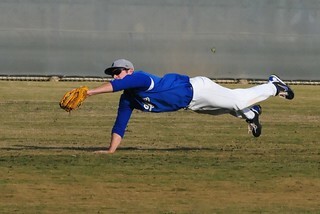 Dodgers - 6th Inning: Spencer Wolfe singles to left and soon steals 2nd. Jason Kent singles; scoring Wolfe. John Coulsell reaches base on a fielding error. Stephan Ohayon singles to left; scoring Kent. Dodgers get 2 runs on 3 hits; with 1 Royals error and 2 men left on base. 14-1 Dodgers. 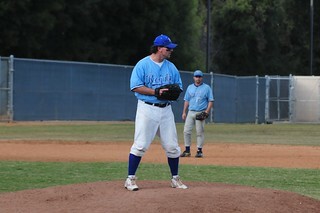 Dodgers - 7th Inning: Matt Gray leads off with a single; then steals 2nd soon and advances to 3rd on a pass ball. Brian Grube singles home Gray. Alex Flores singles to left; scoring Grube. Dodgers get 2 runs on 3 hits; with no errors and 1 man left on base. 16-1 Dodgers. Royals - 8th Inning: Tracey Warren leads off with a single; then steals 2nd and 3rd. Chris Middleton reaches base due to a fielding error; with a run scoring on the play. Sean Spires hits an RBI single. Armando Mesa singles. Royals get 3 runs on 3 hits; with 1 Dodger error and 2 men left on base. 16-4 Dodgers. Dodgers - 8th Inning: Daniel Coulsell singles. Spencer Wolfe doubles to left. Jason Kent follows with his 3rd RBI of the game. John Coulsell hits an RBI single to left. Stephan Ohayon singles for his 3rd hit of the game. Ari Shandling hits an RBI single to left. Matt Gray hits a 2-run single to left. Dodgers get 5 runs on 6 hits; with no errors and a man left. 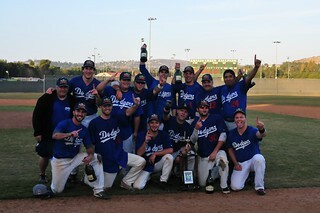 Congratulations to the 2013 AA-Division Champion Dodgers!